Hello, dear model lovers! 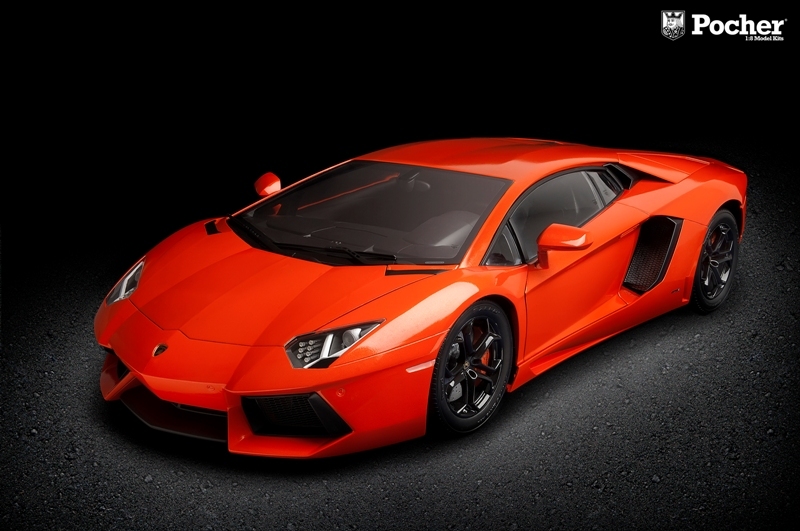 Welcome to our website, one of the best adresses for automotive modelers in big scales. Many of the kits described here have been constructed by ourselves - and we also sell our products directly to you. So: Everything you see on these pages is for sale! The mentioned prices are end-prices including taxes and shipping costs. No additional handling/packing charges! No hidden fees! Please check availability, which you will find under each product description, together with actual prices. This webpage will not be supported anymore in the future. 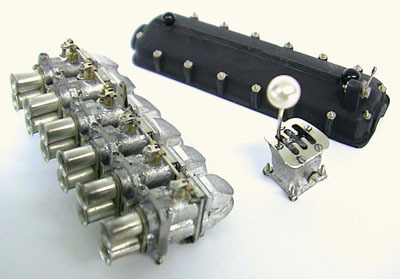 Please visit our new webshop www.shop.autographmodel.com for the latest intormation about automotive kits and models in big scales 1/8 and 1/12! 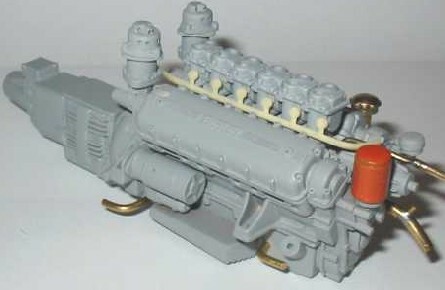 The instructions of the C-Type engine have reached 30 pages! 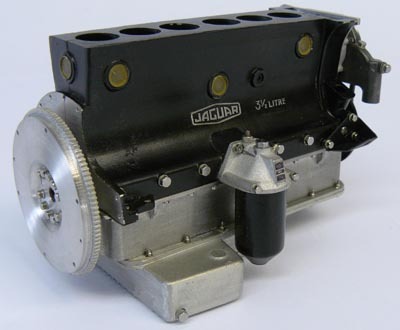 Download on the instructions page or on the Jaguar C-Type engine page in the webshop! My new webshop has a comfortable News System, and in the future I will post any new information there. This website is a little obsolete, and I will not update it anymore, when the Shop is fully established. So please go directly to the News page for any new information. Yesterday the blanket has been tied off the hidden car and the new Pocher kit in scale 1/8 appeared: Lamborghini Aventador LP 700-4. A completely new developed model kit with impressing finish and exceptional detailing. All related news in our new webshop! Our new webshop will go online immediately after the Nuremberg Toy Fair. I am currently working flat out, so there is no new page of the Jaguar instructions today. That will be continued next Friday. 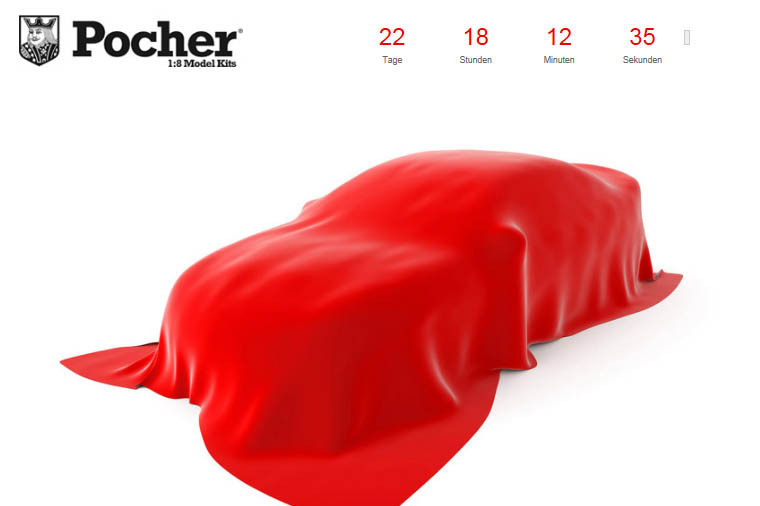 This is the message of the year: At the Nuremberg Toy Fair 2013 (January 30, 2013 - Feb 4, 2013) there will be new Pocher models! 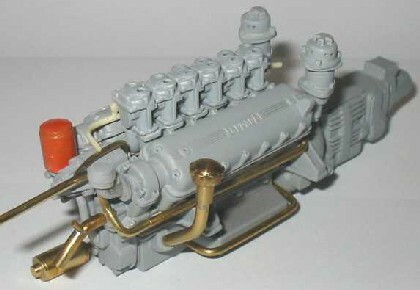 If a note circulating in the internet (www.pocher.com) is true, HORNBY will introduce new Pocher models. 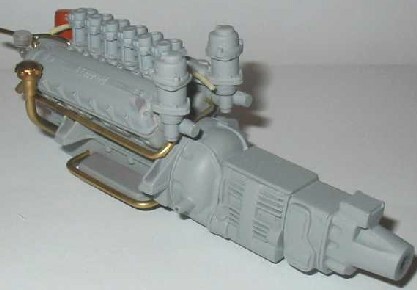 HORNBY had in 2004 taken over the remains of the Italian company LIMA/Rivarossi, where also Pocher belonged to. Since then it was quiet on the kit market in 1/8. Now Pocher is to be awakened to new life. It is not known at this time, whether they will be introducing new models, or just re-launching existing kits again. One thing is certain: Autograph will include these models in its product range, particularly this coincides perfectly with the launch of our new web shop for January 2013. We are very excited! As announced earlier this summer, I am working on creating a professional webshop. 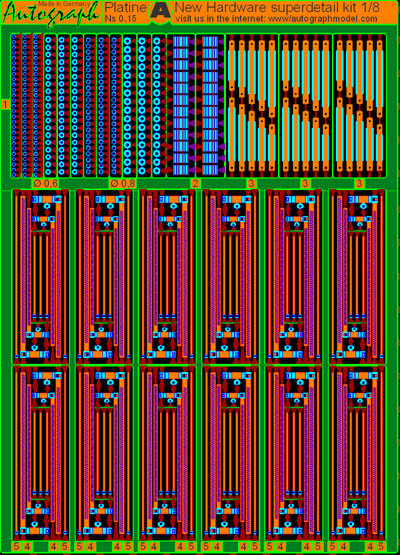 This is expected to go online at 01 January 2013. 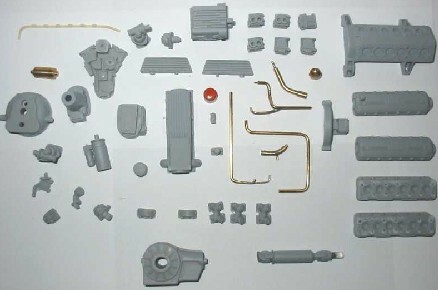 Linked to this will be the introduction of new products, in particular the sale of small parts for model building. More details soon here. Like last year, there is also a December special this year with price reductions of 10% on all Autograph kits. The prices can be found at the respective products. Surely you have already wondered why our website hasn't been updated for so long. Well, the main reason for this is that we change for some time our entire website to a modern web shop. This really makes a lot of work, although we do not offer thousands of products. However, each item must be recorded and entered into the shop, then the whole thing has to be made in german and english, with prices, weight and shipping costs. . . And besides, there is still a new development called the Jaguar C-Type. Again, there is something new to report. 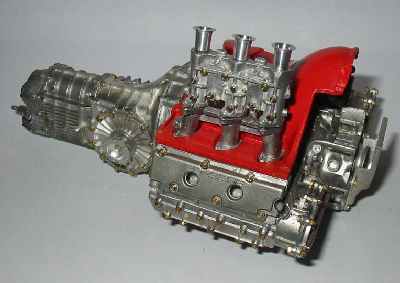 The engine is finished in all parts. Has become truly amazing. Right now I write the instructions, which on the one hand is a lot of fun because it's always very interesting to see whether the parts actually fit together as intended. On the other hand, it is also a lot of work, because every little building step with photos and descriptions must be documented. The danger is that you do it too quickly, for example, overlook the fact that you have to specify every single screw or washer. . .
May 05, 2011 - Fiat 500 in 1:8 available back soon? 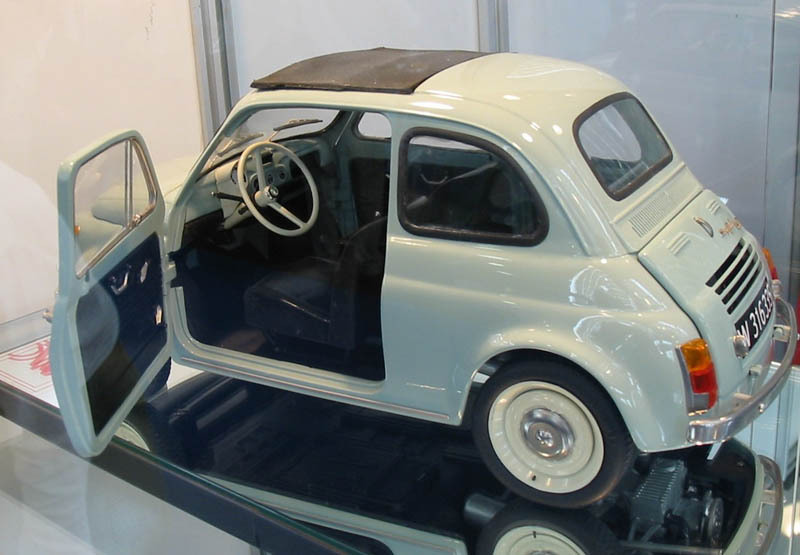 There are rumours from italy, that production of the nice Fiat 500 model in 1:8 will soon being resumed again. Details are not yet known, but the tools seem being taken over from AMC by a successor. As soon as I hear any details, I will announce it here. 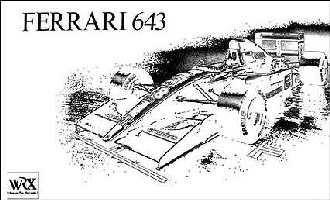 May 03, 2011 - Complete instructions of our F40 transkit now online! 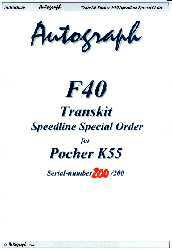 We have put the complete instruction book of our F40 transkit on the "instructions"-page (PDF file). Have fun with downloading and studying! May 01, 2011 - New project takes shape! 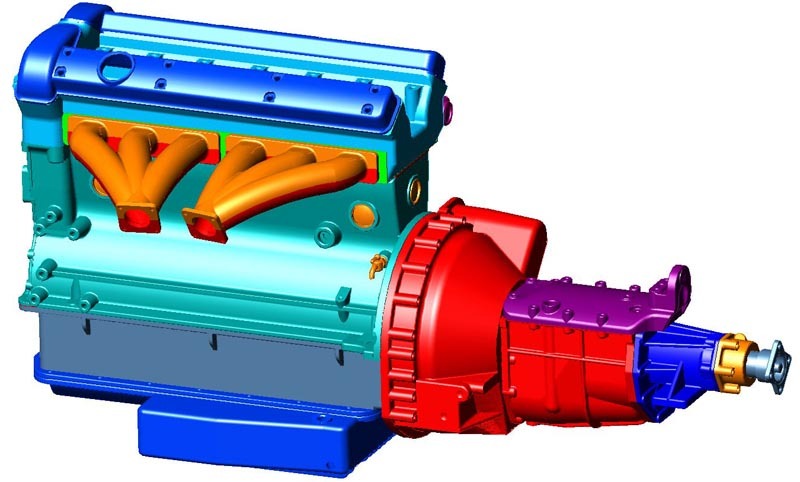 As the contract negotiations with that automobile manufacturer from England, which built the 1:1 model of my new project, are still not completed, I can only show another screenshot of the new engine - all other details have to wait. One thing I can tell, however, already: it will start with a motor kit (full metal, super detailed), and if all goes as planned until the middle of next year, a complete model kit of the entire car will be ready. The plan is a body of thin metal, prepainted finish, so the annoying color work, at least for the body, is eliminated. April 01, 2011 - New project in 1/8! 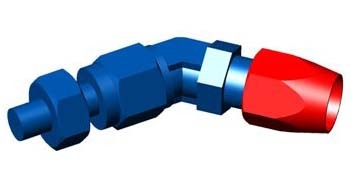 March 20, 2011 - New Aeroquip-fittings and -hose set in 1/8! March 01, 2010 - New Hardware Kit now on sale! Recently the new version of our hardware detail kit is available. 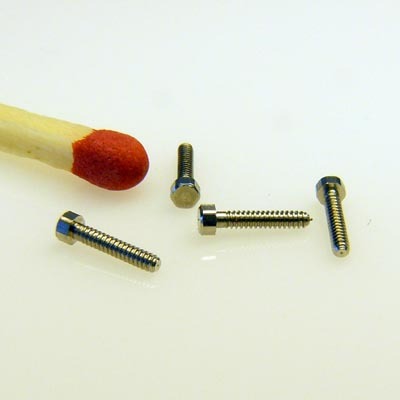 Nuts and bolts now in stainless steel in a variety of sizes and designs! 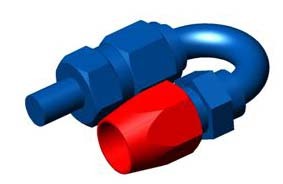 Many newly drawn parts and our cable and hose clamps in a new, improved version. A PDF version of the instructions will be found here. More information about the kit here. January 02, 2010 - New hardware-detail-kit in sight! A new edition of our hardware detail kit was due for quite some time! 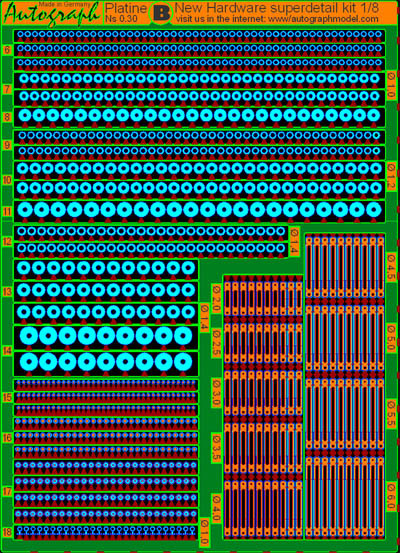 Now I've drawn two completely new platines with many new Photo Etched parts. Proceed in the coming days in production, so the new hardware detail kit will be available probably in February. Presumably it will also include brand new stainless steel hex screws, which are manufactured exclusively for Autograph! 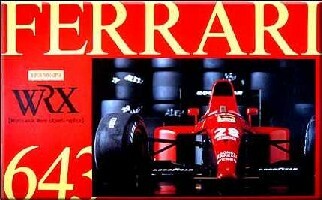 October 20, 2008 - Rosso Ferrari 643 F1 kits in stock! 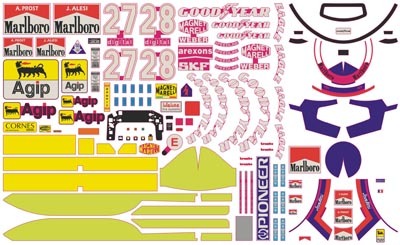 November 22, 2007 - Complete decal set for the Rosso 643 F1 in scale 1/8! When you build your old Rosso 643 kit, which has been stored for many years, you will find that most of the waterslide-decals are not usable anymore: they will crack, as soon as they get in touch with water! And the ugly original "sticker decals" will not hold long on the surface, where you placed them! Therefore we have drawn a complete new decal set for this model, including even more of the additional motifs of the Upgrade parts set. 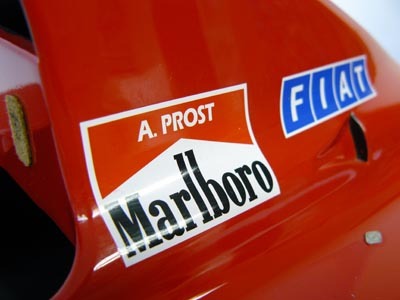 It is currently printed by the well known decal factory of Zanchetti in Milan (Italy) - the No. 1 for waterslide decals in Europe. Please watch this space for more informations - we will give you all informations, as soon as we have the prints in house! 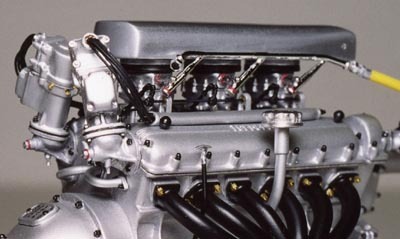 June 22, 2007 - Ferrari-engine kit from CMA (USA) available! January 01, 2007 - Price adjustment because of tax increase only starting from February! 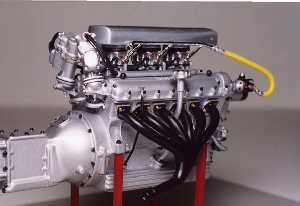 May 30, 2006 - delivery of the GTO engine has begun! What has lasted so long, finally reaches its end. 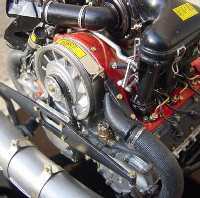 From now on the GTO engine is on sale. 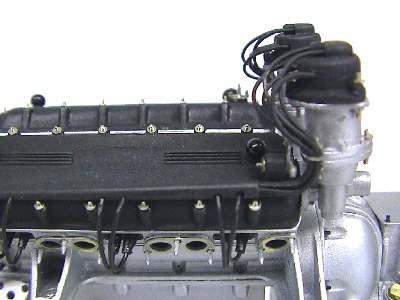 This is the second, very important part of our complete transkit for the Revell GTO in scale 1/12. All Informations here! May 03, 2006 - GTO engine kit finally finished! 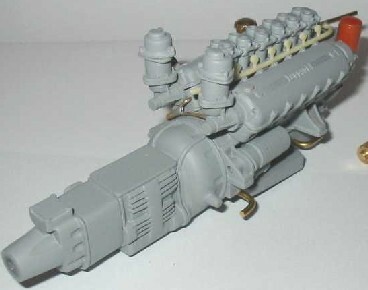 Here are the latest pictures of my GTO-engine in 1/12. I had to completely rework the photoetched plates again, and some parts, like the fuel line (casted in brass and chromed). As soon as these new parts arrive, I will do the last pages of the instructions, and then this engine project will be finally finished! I am back from italy, where I collected the first Cinquecento models from AMC. I am delighted to report, that my relatively high expectations regarding the quality of these kitshave been exceeded: Fiat Cinquecento in scale 1/8 by AMC models! Last weekend I have been visiting the Novegro Model Show in Milan. To say it shortly: There is not much news on the car model market in big scales. 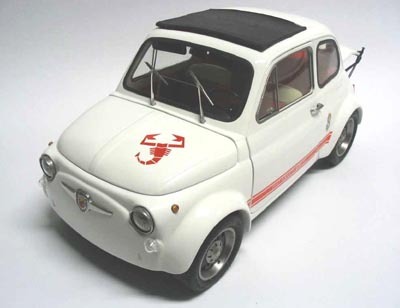 but I have seen a brand new model, which I immediately fell in love with: Fiat Cinquecento in scale 1/8 by AMC models. 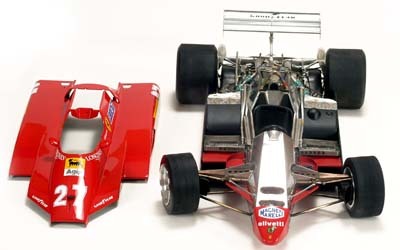 I am pleased to present you an absolutely rare modelcar: Ferrari F300 Canadian Grand Prix Montreal 1998 in scale 1/8 made by Amalgam/Great Britain. 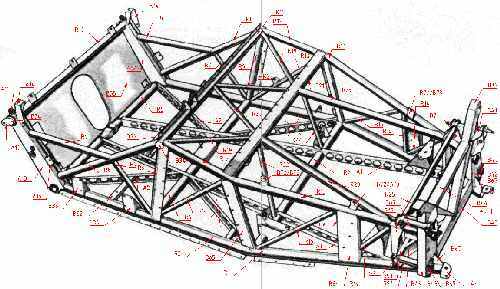 In order to pass the waiting period for the GTO engine, we want to give you access to the first pages of the building instructions with many pictures of the project (so far evenly finished) as a download. You will need Adobe Reader to see or print the file). We put two new photo-galleries about the Porsche Carrera RS engine from L & P on our website: The standard version and the new version with Weber-carburettors. 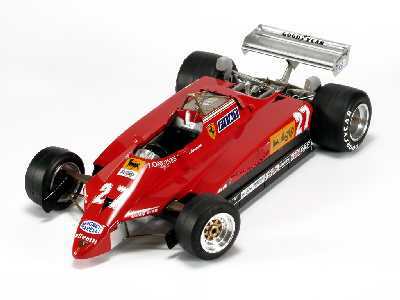 We are very proud to announce a sensational new Ferrari model in scale 1/8th! 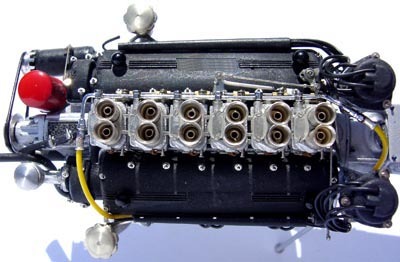 126 C2 Formel 1 turbo von 1982. This great new Formula One Ferrari comes from Italy (from where else!) 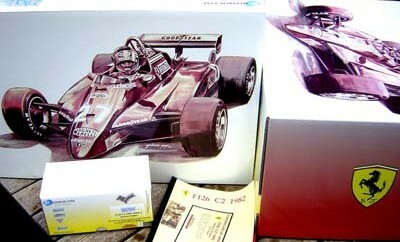 and it is in my opinion the most important release for years in the totally dried out 1/8 scale market! 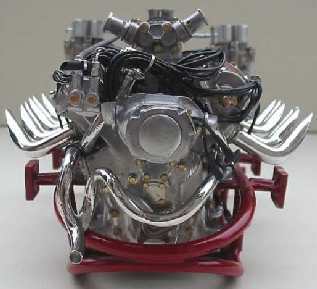 From today the Arno Hydroplane Ferrari engine in scale 1/8th from Leggenda e Passione is on sale! 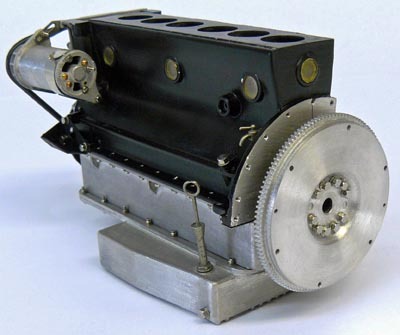 That unfortunately means an enormous price increase for these wonderful metal kits - only those of our customers can be pleased, which bought the Porsche engine in the past for relatively little money. Congratulations! 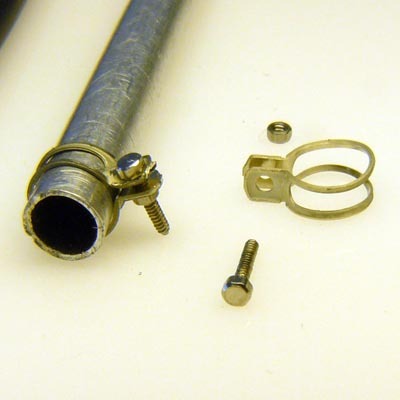 Yesterday I received the last parts which were missing for the Borrani wire-wheelkit - delivery can start from now! We have been sending away the first examples of our latest edition of the F40 transkit this week. We have a new F40 photo-gallery prepared for you! and the best: no price increase in relation to the last series - price still Euro 1200. Now you can select your desired serial-number (between 002 and 199): If you order your Transkit, tell us your desired number. We communicate to you then whether this number is still available. If you want to have your number reserved (possible up to 6 months), then you make a pre-payment of 10 % on the purchase price. This pre-payment is naturally taken into account with payment of the remainder - thus your reservation costs finally no cent! Each of these versions is limited to 250 copies. You can also from today on book the Revell basis model - however we will sell this model only together with our kits. The Borrani wheel set will likewise be availabel in the near future including the wonderful Dunlop Racing rubber tires, which Revell draws up on the GTO. So our Borrani wheels could be used also for other models in 1/12th scale. 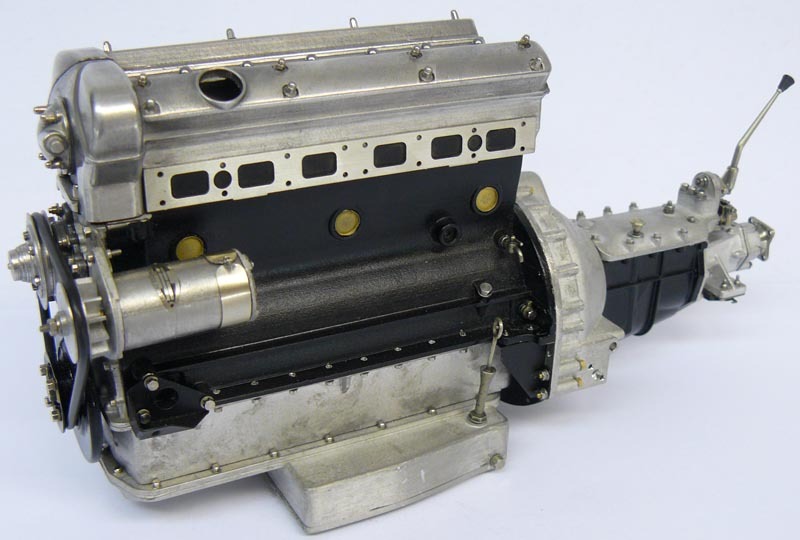 Here are the first pictures of the prototype of the 250 GTO-engine, made by Corrado of Leggenda e Passione for my GTO-transkit. Momentarily I have not decided, which parts will be made in resin and which in white metal. 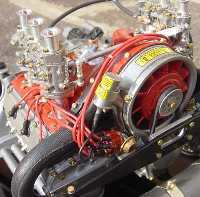 Porsche engine of Leggenda e Passione with weber carburettors: Stefano from L&P works for the moment on a version of his Porsche engine with weber carburettors. 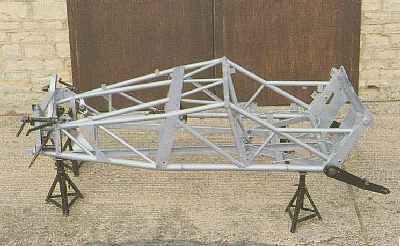 The represented framework belongs to a sports car, which I will manufacture on a scale 1/8 complete model kit - this will be no Transkit! 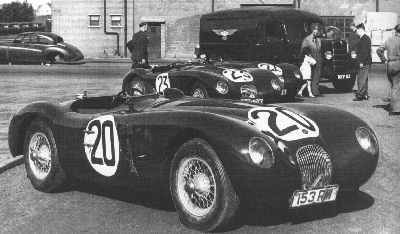 Please send me a short email, if you know, which car it is and particularly from which year exactly this framework comes! The first correct answer will be awarded with a detail set from me, consisting of a hardware superdetail kit and a cable set! Well, much fun when investigating! On the occasion of my attendance with Stefano Corsini of Leggenda e Passione in Milan I have brought home some interesting projects from Italy: Beside that engine for the Arno hydroplane, specified down, Leggenda e Passione possibly will do a further Ferrari twelve-cylinder: The 250 GT engine formed the basis engine for almost all GTs with the prancing horse in the sixties. A condition is however appropriate interest of customers! If you should be interested in such a machine, then send a short E-Mail to Autograph . With appropriate resonance I can surely convince Stefano to make e.g. 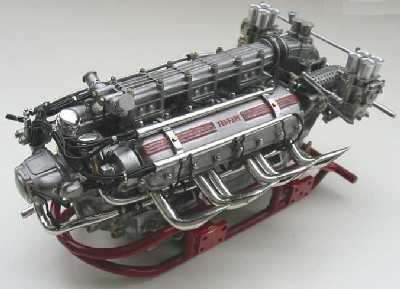 a GTO engine in 1/8! 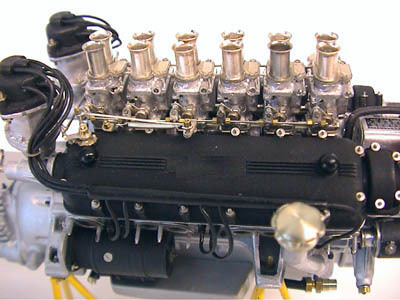 Leggenda e Passione has a new engine project: Ferrari 12-Zylinder boat engine - basis for a Transkit for the Arno hydroplane! First photos! 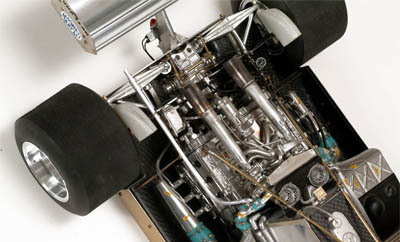 New kit from Leggenda e Passione: Porsche R-S 2.7 of 1973 - now available! I bring along new supply from Milan: All kits of Leggenda e Passione now again in stock! 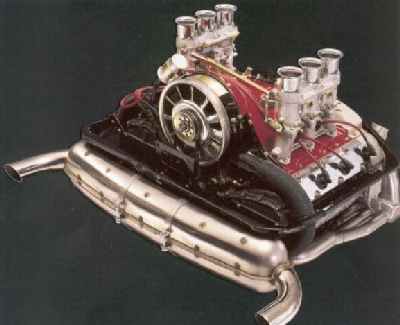 Particularly 312 PB engines and the Alfa Monza Transkit!